I am used to having iObit on my PC so know the software very well. Their newly updated Advanced Mobile Care is now available for Android Phones. And believe me you wont find a better App than this one. Advanced Mobile Care is an all-in-one Android security and performance optimization app that performs real-time virus scans while also featuring a brand new Anti-theft, powerful Game Speeder, Battery Saver, Call Blocker, App Manager, Task Killer, Privacy Locker, Privacy Advisor and Cloud Backup. And all this comes for free. One touch anti-virus scan protects your device from viruses, malware, spyware, and suspicious apps. It also provides real-time protection from virus attacks when downloading a new app or unknown file. Turn on the Anti-theft function by setting a password, and then you can alarm, lock, or get location of the lost phone. Try these features of Anti-theft by tapping Find lost phone. Optional-Set battery saving mode to extend battery life as well as inform users about which apps consume the most battery power. Call Blocker helps you block unwanted calls. Add the unwanted calls into the blacklist manually or just block calls from non-contacts then you will not be disturbed by the unwanted calls. One touch scan can clean memory, cache and junk files to boost your phone's operating speed. Launch games with Game Speeder to make games run smoothly without lag or game-play disturbance. App Manager can batch delete APK files, move app to SD card, batch uninstall apps. It also can sort all apps by name, size or use frequency to identify large or unnecessary apps for removal. Scan and display all apps that access your personal information, such as personal data, contacts, locations, and SMS. 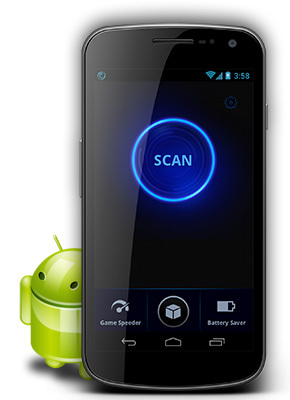 Perform quick scan directly from your Android desktop. Quick check system information and set a battery saving mode. It also supports Nexus 7, Nexus 10, Galaxy Note, Asus Transformer and most other tablets. Actually this I feel is a must have App for Android users. So give it a try here from Google Play.